Paige Brookstein descends the Creekside Trail at the Steamboat Ski Area. Photo by Aryeh Copa. 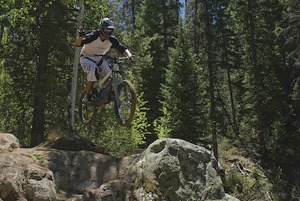 Steamboat Springs, CO - "Fear creates one point of attention," says mountain biker Aryeh Copa. His voice carries a calm rationality when he speaks of the adrenaline junkie's life-and-death dance: "Fear creates focus. It keeps us alive. If you have no fear, you're not going to live very long, especially doing extreme sports." As one of the organizers of the Steamboat Springs Trails Alliance, Copa has temporarily set aside his own addiction to adrenaline for something more magnanimous. Working together as the Alliance, Routt County Riders, the Steamboat Springs Bike Town USA Initiative, Yampatika and the Steamboat Springs Running Series are seeking to put Steamboat on the map for two-wheeled tourism, joining established biking destinations like Moab and Whistler. The organizers contend that they are proposing a true network of trails to serve all users: mountain bike riders from beginner to expert, but also non-riders who want to access the backcountry. "We have taken everyone's thoughts into account and we're trying to be as unselfish as possible," Copa explains. "Some of the trails that I want to see the very most are near the end of our priority list." The list is certainly ambitious, outlined in a 246-page proposal that includes everything from a "signature" multi-million dollar trail at 9,200 feet to in-town connections on the paved multi-purpose Yampa River Core Trail. Costs could exceed $18 million and the timeline is projected to span ten years or more. But with two major funding victories this spring, momentum is gaining for the town seeking to earn a title it trademarked in 2010: Bike Town USA. On April 18, Bell Helmets announced that Routt County Riders, one of the founding members of Bike Town USA, had won a share of a $100,000 grant. The funds will build a new expert jump line at the city's one-year-old Bear River Bike Park. Just one day earlier, the Trails Alliance’s proposal beat out 39 other project proposals vying for Steamboat’s newly up-for-grabs lodging tax revenues, earning an official committee recommendation to City Council. Assuming City Council puts the Trails Alliance proposal on the ballot and voters approve it this November, an estimated $600,000 could be invested annually in Steamboat's trail network over the next decade. The new trails and improvements would extend from Rabbit Ears Pass to Mad Creek (near Strawberry Hot Springs), from Emerald Mountain to Buffalo Pass – adding new amenities and improved access in and around the city. While not unanimous in their support, locals are largely enthusiastic: out of 441 respondents to a recent online poll, more than 80% supported the proposal. But once upon a time Steamboat wasn't so quick to embrace mountain biking. Downhill mountain biking took a rocky turn here in the Yampa Valley a decade ago. The 2003 Mountain States Cup race had scheduled a new tour stop on Mount Werner. Racers showed up with burly downhill bikes and full body armor, making lightning-speed practice laps down the mountain. In those days, all trails were built for two-way traffic, meaning hikers had to share each narrow trail with gonzo downhillers. Complaints flooded in from terrified tourists. Just two weeks before the race, the ski area banned downhilling. "People are afraid of riders in full-face helmets if they haven't been around them," says Copa. "I guess I can see why: it's like a Storm Trooper coming down at you. It doesn't look like you're human." Why all the gear? Copa explains that unlike skiing, where sliding on snow can soften a fall, downhill freeriding on a mountain bike pits riders against unforgiving rocks and the hard earth. As a response to the friction surrounding the ban, Copa and others fought for dedicated downhill-only trails and launched campaigns for mountain bike etiquette. They encouraged downhillers to stop and lift their facemasks for other trail users, hoping to reduce the intimidation factor of all that protective equipment. "That was when the push started from citizens and some of the freeriders in town," recalls Copa. "So the ski area started building trails." Geoff Hollister catches one-handed air while riding the Creekside Trail at the Steamboat Ski Area. Photo by Aryeh Copa. Copa believes the addition of lift-served trails is a critical stimulus for attracting people to the sport and to the resort. "If you can only ride 2,000 vertical a day on a bike, or on skis, you're never going to become an expert," he explains. "But when you get 20,000 vertical riding chairlifts, you can get as good in a day as an entire year of earning your own turns." Steamboat Ski and Resort Corp. lifted its 2003 downhilling ban, and over the years freeriding gradually picked up speed. In 2010 the movement finally hit its stride when the resort commissioned Whistler-based Gravity Logic to design a new on-mountain bike park. If successful, this would be Steamboat's answer to Whistler's immensely popular park, which boasts more visitors than any other in North America. The decision required a leap of faith. It would represent quite a gamble for a profit-minded resort corporation. "Those guys really stepped up. They bought an attachment that converts a crude excavator into a machine that can do some pretty amazing stuff," says Tom "Pro" Prochazka, a partner and director at Gravity Logic. He goes on to describe the machine, an Engcon Rototilt, with boyish enthusiasm for the mechanics of moving dirt. But its estimated $25,000 price tag was hardly child's play. Steamboat Ski and Resort Corp.'s Jim Schneider pushed for the machine's purchase. "You spend that kind of cash, it has you questioning if it has value," Schneider says, "but I got to see it in action and it was just amazing." While Schneider won't reveal numbers, Prochazka speculates that the Rototilt paid for itself in its first season. Extending beyond the mountain itself, there are already more than 500 miles of singletrack trails in the Yampa Valley. For the past decade, self-described trail stewards like Copa have been pushing for even more. That push takes patience: creating a new authorized trail often requires cooperation from ranchers, private landowners, the Forest Service and an ongoing volunteer labor force, not to mention funding. Throughout the effort, many different users – from hunters to hikers, horseback riders and birdwatchers – expect their voices to be heard. Meanwhile, impatient riders have taken matters into their own hands, ultimately muddying the process. "We have trails we call unauthorized – people call them renegade, rogue or outlaw trails – that have been constructed without authorization of the Forest Service," says Kent Foster, recreation program manager for the Routt National Forest. "They are not on our system and therefore we haven't maintained them. Right now we don't receive enough money to maintain the trails that we have." Some of the unauthorized trails intrude on protected archaeological sites, while others threaten wildlife habitat. The Forest Service has been known to barricade rogue trails, only to see new ones pop up or the old ones stealthily reopened. "It's a game of cat and mouse," says Foster, who forges partnerships with groups like those behind the Trails Alliance proposal in order to break this cycle and maintain an authorized network of trails. The Trails Alliance proposal directly addresses many of these rogue trails, seeking to either legitimize or reroute them. While it will take a nod from City Council, the support of voters, millions of dollars and many years of work before the full Trails Alliance proposal might reach all of its ambitious goals, organizers like Copa are buoyed in their efforts by their verve for the sport. For Copa, it is a life philosophy that verges on the spiritual. Pondering those who practice yoga and meditation, he says, "It's really difficult to totally clear the mind; a lot of people are never able to achieve it. But skiing trees really fast on a powder day or riding a mountain bike down the hill on the edge of control are really easy ways to achieve meditation." He continues without taking a breath: "There's no other option but to have that one point of attention, to be focused fully on the moment, on what you're doing, in order to stay alive and make it to the next turn. And that's where I think the adrenaline really is, where its most powerful force is. I see it as a force for good. For those of us that have this curse of needing adrenaline on a regular basis, it provides a clarity of mind we may not achieve otherwise." In November, Steamboat voters will likely have an opportunity to approve or decline one major source of funding, the lodging tax revenues, for the Trails Alliance proposal. It's a play that could benefit the community by expanding Steamboat's multi-season reputation as a sports paradise, offering exhilaration for every level of rider. But for a dedicated mountain biker like Copa, it's all about the rush of scaring himself into mental clarity. "Adrenaline's our drug of choice: it's legal and free," he says. "That's really why we want a lot of these trails." Writer and filmmaker Greg I. Hamilton lives, works and plays in Steamboat. In Steamboat Magazine's Winter 2012/13 edition he shared how his Sundance-selected film "The Movement," found its original inspiration here on his home mountain. At a glance: The Trails Alliance’s proposed projects are not just for expert mountain bikers. Extensions to the paved multi-use Yampa River Core Trail, such as a scenic and historic loop around Legacy Ranch at the trail's southern terminus (currently an abrupt dead-end). Connections to local hotels not currently on the Core Trail, which would allow safer access without crossing Highway 40. Amenities at the base of Emerald Mountain – including parking, full restrooms and a bike wash – to improve appeal for families and beginner riders while alleviating neighborhood parking issues. A hiking-only trail, free from bike traffic, at the base of Rabbit Ears Pass with views of Lake Catamount. The Uranium Mine Extension would provide an unabashedly experts-only downhill ride from Buffalo Pass Road to Fish Creek Falls Road. Purpose-built features on trails like Buffalo Billy's would lure advanced riders away from “rogue” trails on Buffalo Pass, preventing erosion. Dual slalom courses near the base of Emerald Mountain could target recreational racers, much like skiing's NASTAR, while serving as a venue for pro and amateur competitions. Jumps, berms, rollers, drops and wood features would offer "adrenaline filled fun" on at least a couple new expert trails at the foot of Rabbit Ears Pass. Desirable tourists: The economic impact of mountain bike tourism on communities like Steamboat (pop. 12,088). Fruita (pop. 12,646) – Velo News reported in 2011 that "mountain bikers contribute about $25 million annually to the economy" of this western-Colorado town. That's around 15% of the entire county's budgeted revenue. Whistler (pop. 9,824) – An oft-cited 2006 case study identified $34 million in mountain-bike related tourist spending over just one summer. Jackson (pop. 9,577) – A 2011 University of Wyoming study determined that visitors lured by the local Jackson Hole trail system created $17 million in economic activity over just one year. Out-of-towners (132 of the survey's 303 respondents) spent an average of $1,122 per visit, which averaged 6.7 nights' lodging. Walton Rim Trail: A highlight from the Trails Alliance’s wish list, this 20-mile trail could become the flagship of 46 proposed new projects. According to organizer Aryeh Copa, this trail has a broad appeal to all levels of rider. "It's a beginner trail but would also be laid out with flow in mind," he says. "An expert could 'big ring' it: probably ride the whole 20 miles in an hour and a half, and have fun on a flowy trail doing it."